As a physiotherapist you don’t necessarily work in a hospital. You might be based in the community for GPs practices or in industry or special schools or even in private practice. In fact anywhere people need treatment to be mobile for work or an activity. Whether you treat people for the effects of ageing, illness or accidents it’s important to look the part. That way you instil confidence in your clients / patients. However it’s equally important physiotherapists uniforms are comfortable since the work involves movement and often specialist gym equipment or even hydrotherapy. A physiotherapist’s uniform is very varied and determined by your work environment and requirements or personal choice. 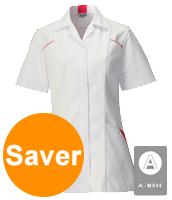 Our A-Move Tunics are well suited to the bending and stretching required of a physiotherapist. Exclusive to Alsicare, their unique design allows far more freedom of movement and keeps the wearer cool. Special features include open arm-hole vents and internal mesh to allow movement. Our Female A-Frame /Move Tunics and Male A-Frame/Move Tunics are available in white with contrasting piping in various colours. Female tunics are available in sizes 8 to 28 and male tunics in sizes 36 to 48. A logo or name can be embroidered and Saver Packs of 4 Male A-Frame or female tunics are available in same or mixed-size packs. We know some physiotherapists work with critically ill patients. For that reason we have physiotherapists’ Unisex Scrub Tops and Unisex Scrub Trousers available in 5 colours. With design details such as elasticated corded waist, pockets and vents we don’t think you’ll find more comfortable workwear for physiotherapists involved in the care of ICU patients. 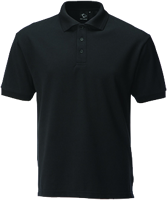 For a more casual look we design a Premium Quality Polo Shirt made from a superior 67% polyester and 33% cotton blend. It’s available in sizes XSmall to XXLarge and in a range of 7 colours including black, navy and white. It can be teamed with any of ourTrousers. For women we have a Female Elasticated Trouser – Navy available in sizes XSmall to XXLarge. For men, we have Mens’ Trouser Two – Navy available in Regular and Tall fits and in sizes 30 to 42.